Our Biological Safety Cabinets are containment units suitable for the preparation of low to moderate risk agents when there is a need for protection of the product, personnel, and environment. We offer a ranges of cabinets depending on the researchers needs and budged. 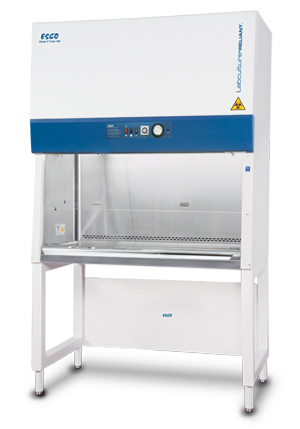 All of our biological safety cabinets use ULPA filters to treat exhaust air. ULPA filters have are tested to a typical efficiency of >99.999% for 0.1 to 0.3 micron particles; these provide better filtration capability than conventional HEPA filters that have a typical efficiency of >99.999% for 0.3 micron particles. Protect Lab Operator and important specimens from contamination risk with the Labculture® Reliant Class II Type A2 Biological Safety Cabinet (E-Series). Used in thousands of laboratories worldwide and research facilities across North America, the Labculture® Reliant cabinets blend the best in performance and simplicity, with market-leading feature sets, quality, ergonomics and value. Best in Filtration: Uses 2 ULPA (Ultra Low Penetration Air) filters which operate at a typical efficiency of 99.999% which is, ten times the contamination protection over conventional HEPA filters. Easy Cleaning: The work space is a single piece coved stainless steel without any screws or connectors. Extra Protection: Isocide™ powder coating finish prevents microbial/bacterial growth on the exterior and interior. Operator Comfort: a 10-degree sloped front and arms rest deliver optimal ergonomics for maximum operator comfort. External Dimensions (W x D x H) 44" x 33.5" x 60.6" 56" x 33.5" x 60.6" 68" x 33.5" x 60.6" 80" x 33.5" x 60.6"
Gross Internal Dimensions (W x D x H) 38.2" x 24.5" x 26.4" 50" x 24.5" x 26.4" 61.8" x 24.5" x 26.4" 73.6" x 24.5" x 26.4"